This is the most touching and inspirational audiobook I've ever listened to. The message is that God has a purpose/mission for each and every one of us and how we need to pay close attention to the messages that God sends us about what that is. It makes you stop and think about what talents we have that could be used to help others if we only have faith and allow the Spirit to channel that strength through us. 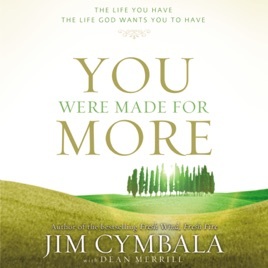 Pastor Cymbala does an excellent job of narrating his book and speaks with such passion and enthusiasm. He also refers to specific Bible Books/chapter/verses throughout the entire book. I was gifted with this by a friend from church while starting a new job and a new life in a big city. Listening to it always grounded me back to what i was about as a Christian and motivated me to carry on stronger and more diligently in God's plan for me as he revealed it. I recently sold my car and left the set of discs in the cd player. I hope whoever bought my car will enjoy and be encouraged my them now.